The Charles Darwin University Centre for Youth Music (CYM) students between the ages of seven and 17 recently participated in the 46th North Australian Eisteddfod held at the Darwin Entertainment Centre. 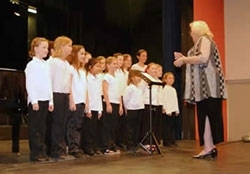 Students entered both individual and group sections in a number of musical categories and achieved excellent results. The Eisteddfod is a festival of performance which ‘encourages and fosters the pursuit of excellence in all disciplines of the performing arts’. It’s the vehicle by which people from all walks of life can be given the opportunity to perform in a theatre and receive constructive comments regarding their performance. The CYM would like to congratulate all participants and their teachers in achieving these successes. The Centre for Youth Music offers a comprehensive program of music tuition, both in individual instruments and also orchestral ensemble programs, for young musicians aged three to 18 years. For more information please contact 8946 6013 or www.cdu.edu.au/cym.